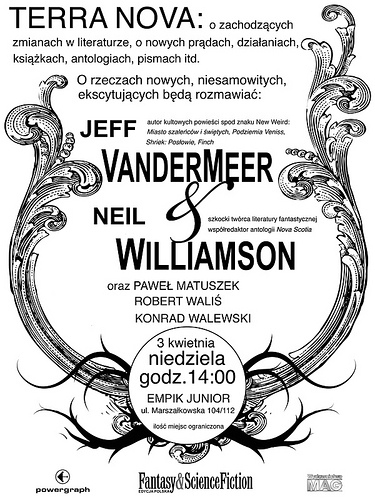 So, I’m going to be in Warsaw this weekend as a guest of the Polish edition of F&SF magazine (who have also just told me they would like to translate my story, The Euonymist, for their forthcoming issue!). For a variety of reasons I’m looking forward to this trip with unreasonable levels of excitement. I’ve never traveled to the Eastern side of Europe before, so it’ll be very much a voyage of discovery. Which is the best kind, I feel. It’ll be all the better because I’ll be sharing the experience with the legendary Jeff VanderMeer. Jeff’s doing quite a lot in the way of signings and radio and TV interviews (see here for his itinerary), and I’m looking forward to accompanying him for much of that, although sadly my lunchtime flight home on Monday means I’ll likely miss out on that day’s events. The main event for me is a panel discussion entitled “Terra Nova”, being held at 2pm on Sunday April 3rd in a venue called EMPiK Junior. I’ll be joining Jeff, translator Robert Walis, and F&SF editors Konrad Walewski and Pawel Matuszek, and we’ll be talking about new trends in world literature. Should be both interesting and fun. If you’re in the area please come along. Or if you’re coming along to Jeff’s signing session on the Saturday, please come up and say hi. I’m looking forward to meeting you and Jeff. I’m sure we’ll all have a great time during the weekend. See you! BTW, I’ve just read your story “Happy Gang” and enjoyed it a lot. I’ll definitelly check out more of your writing. Thanks Robert, that’s very kind.